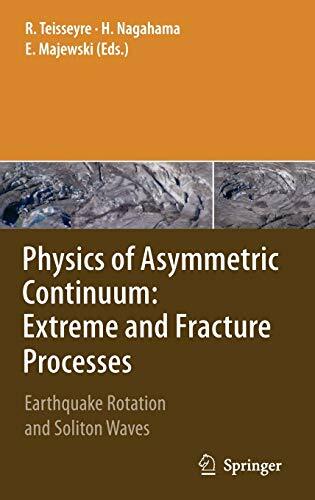 Our new monograph has been inspired by the former one, Earthquake Source Asymmetry, Structural Media, and Rotation Effects (R. Teisseyre, M. Takeo, and E. Majewski, eds, Springer 2006). Some problems, c- cerned primarily but not exclusively with the basic theoretical nature, have appeared to us as worthy of further analysis. Thus, in the present mo- graph we intend to develop new theoretical approaches to the theory of continua that go far beyond the traditional seismological applications. We also try to present the links between the experimental data, the observed rotational seismic waves, and their theoretical evaluation and description. In addition, we consider the basic point motions and deformations, and we intend to find the invariant forms to describe such point motions. We believe that there must exist the basic equations for all point motions and deformations, and we derive such relations within a frame of a continuum theory. Thus, in the considered standard asymmetric theory, we include relations not only for the displacement velocities but also for a spin motion and basic point deformations as well. We include here the axial point - formation and twist point deformation represented by the string-string and string-membrane motions. A twist vector is defined here as a vector p- pendicular to the string-string plane and representing its magnitude. It - comes an important counterpart to spin and a key to the presented theory. We show in the forthcoming chapters that the twist motion describes the oscillations of shear axes.